The Minister of Planning, Dr. Nouri Sabah al-Dulaimi, received on Wednesday at the Ministry's Cabinet Mr. Ahmed al-Yasiri, representative of the United Nations Development Program (UNDP) and his accompanying delegation. The meeting discussed the humanitarian issue in the liberated areas and ways to enhance the stability WFP program in these areas. The Minister commended the efforts exerted by the program during the last period, calling for increased international support for the implementation of more projects, which will be implemented within the vision of the Ministry for Development and Sustainable Development of Iraq 2030, pointing out the importance of contributing to the development of solutions to meet the challenges of local development, The possible efforts to implement the population census to be carried out by the Ministry in the last quarter of 2020. Dr. Nouri al-Dulaimi discussed the mechanisms of directing the allocations of the program in Iraq, which reached this year to the highest levels of 900 million dollars, as part of the operations of restoring stability and relief of the displaced, of which $ 600 million so far. 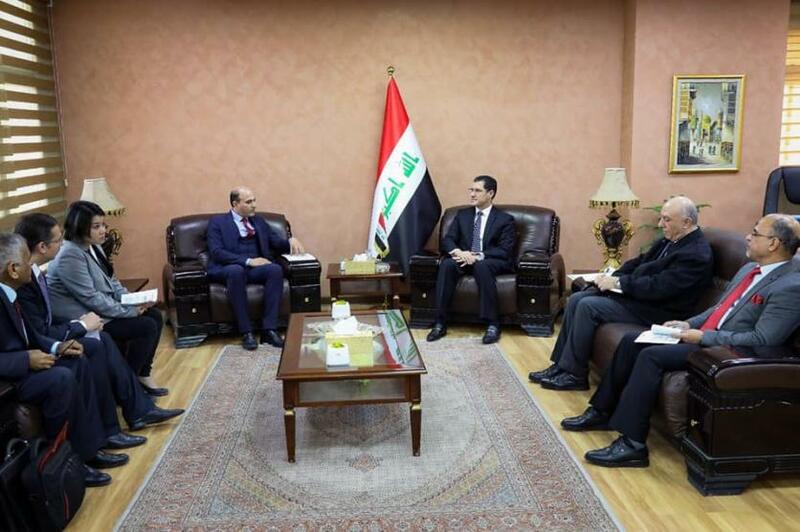 For its part, the delegation of the United Nations Development Program (UNDP), in support of the partnership of work with the Ministry, stressed within the parameters laid down by the Ministry of Planning in its next five-year plan, while sparing no effort to attract international support for Iraq.